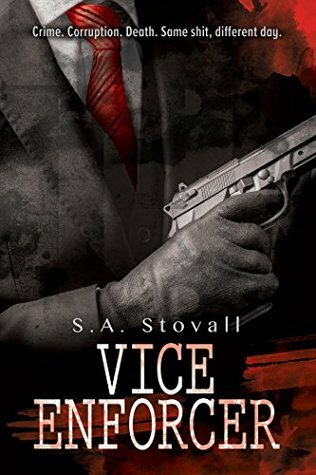 Eight months ago, Nicholas Pierce, ex-mob enforcer, faked his death and assumed a new identity to escape sadistic mob boss Jeremy Vice. With no contacts outside the underworld, Pierce finds work with a washed-up PI. It’s an easy enough gig—until investigating a human trafficking ring drags him back to his old stomping grounds. But he’s not going down without a fight. Eight months after faking his death, Nicholas Pierce assumed a new identity. He’s a trainee PI. Miles Davenport, his boyfriend, is now a cop trainee and he’s at the top of his classes. But when an investigation brings Pierce back to Jeremy Vice’s turf and his old life, Pierce and Miles realize that maybe their chance for a happy ending isn’t in the cards for them. 5 months and 1 week, that’s how long I waited this book, and yes I was counting. After the sublime Vice City I had 5 months and 1 week to imagine and anticipated this book. And you know what, it was nothing like I was expecting. The author took another path, a brilliant path, a necessary path. In this sequel, we follow Pierce and Miles trying having a normal life, at least as normal as it can be with the two of them. Pierce tries to have a legit job by being a PI. He’s still grumpy, blunt with no care for everyone except Miles. When the PI who trains him asks for his help in an investigation about human/child trafficking, Pierce accepts (not for free). He tries to play by the book, and the law, but in the end, because he is who he is, he decides to play by his rules, the one he knows best. Miles is stronger than before, he’s one of the best trainees of his classes, and refuses to jeopardize his future by breaking the law, but he also refuses to let Pierce deal with his investigation alone. I love this new Miles, stronger, more mature. I love how he refuses to hide Pierce from his new friends, how he refuses to give up on Pierce at all, and when he has to make a choice between Pierce and the rest of the world, Pierce comes first…. That my friend, is love! I love these guys. They’re perfect together, they’re the exact opposite of each other but also complementary. I also love how the book explores their relationship more. With Pierce experimenting the family life with dating his boyfriend, having kids around them (Miles’s little sister and brother), and, my favorite, jealousy. It was beautiful and poetic in a weird dark way (we’re talking about Pierce, guys), but it was also kind of naïve coming from him. I adore this about him, this vulnerability behind all his bravado and assholiness. I love how the author took me in a completely different direction than what I expected. I admit, I was expecting a repeat of book 1 with the same dark violence atmosphere, the same noir Polar, and with the big bad revenge of Pierce. (I had 5 months and 1 week to think about it, and I have a wild imagination) I didn’t expect to see a “domesticated” Pierce, I was surprised, but in a good way. The Noir atmosphere, the dark side of the city and the ambivalence of the characters are still here, and it’s the soul of this series. But after what they’ve been through in book 1, they couldn’t go all guns blazing against Jeremy. I understand it now that they needed to heal, physically and emotionally. And I love that the author shows us this, how they healed and sealed their relationship. If we had a doubt about Pierce and Miles as couple in book 1, trust me, after this one there are none. This sequel confirmed my love and admiration for this series and the author’s talent. I highly recommend this book and series, really, you’ll love it, and for now, its the best Noir MM Romance I have read. It’s 5 OptimuMMs (unofficially it’s still 20 out of 5).